The Exxon CEO testified today in front of the Senate that the science of climate change “is not conclusive.” Here are some other things he’s wrong about. Exxon CEO and Donald Trump’s nominee for Secretary of State Rex Tillerson took the stand today to answer questions from the Senate Foreign Relations Committee, and the results were less than informative. 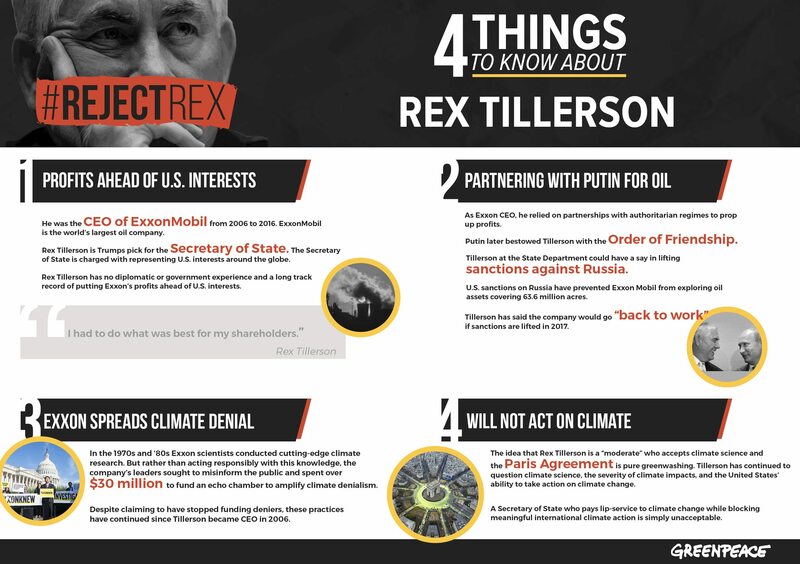 Tillerson dodged questions on his relationship with Russia’s Vladimir Putin, Exxon’s history of funding climate denial, and how we would address human rights abuses as Secretary of State. So instead of waiting for Rex to answer a direct question, we did some research to find out what he really stands for. The Secretary of State is the country’s top diplomat, in charge of representing U.S. interests around the globe. Not only does Tillerson have no diplomatic or government experience, he’s repeatedly violated U.S. policies to boost Exxon’s bottom line. To top it off, a 2016 Oxfam report found that Exxon had $51 billion in offshore cash and subsidiary located in corporate tax havens to avoid paying taxes to the U.S. government Tillerson now wants to help run. Tillerson as Secretary of State would virtually guarantee an oil rush in the Russian Arctic — oil that’s only accessible due to climate change in the first place. In 2011, Tillerson’s Exxon signed a $500 billion agreement with Russian state-run oil company Rosneft. In 2014, State Department sanctions blocked them from drilling and cost Exxon $1 billion. As Secretary of State, Tillerson would have a say in lifting these sanctions, enriching himself and his former employer without any clear benefit to the American people. On top of that, drilling in the Arctic is an extremely risky proposition due to harsh conditions and immense difficulties of cleaning up an oil spill, and would push the planet further toward the brink of climate chaos. In the 1970s and 1980s, Exxon scientists conducted cutting-edge climate research. But rather than acting responsibly with this knowledge, the company’s leaders misinformed the public and spent more than $30 million to give birth to climate denial as we know it today. In 2015 alone, Tillerson’s Exxon spent $27 million on efforts to obstruct climate change policies and gave nearly $2 million to groups that spread misinformation about climate science and block climate action. All the while, Exxon profited off of fueling climate chaos. 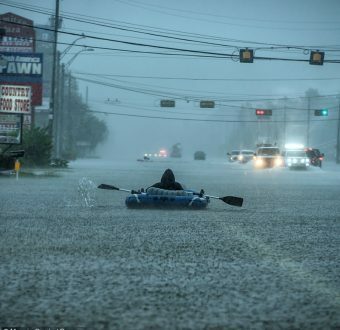 From the time Exxon began investigating the impacts of burning fossil fuels on the Earth’s climate in 1978 to when reports of its knowledge of climate change broke in 2015, the company’s annual profits rose from $2.4 billion to $16.2 billion. In the wake of his nomination, some in the media argued that Tillerson would be the most moderate on climate of Trump’s cabinet picks — almost all of whom outright deny climate science. Make no mistake, he’s as much a denier as Trump is (and Pence, Perry, Pruitt, Zinke, Sessions, and basically the rest of the administration). His company’s business model is not consistent with the Paris climate goals, it has lobbied against strong climate policies, and has continued to direct its political contributions to politicians who are science deniers and who oppose climate action. Tillerson himself has continued to question basic science, the impacts of climate change on communities around the world, and the merit of climate action. Don’t let Exxon hijack our democracy. Tell the Senate to reject Rex Tillerson’s nomination for Secretary of State today! 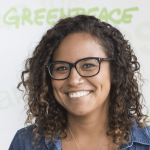 Tina Solin is a social media specialist at Greenpeace USA.